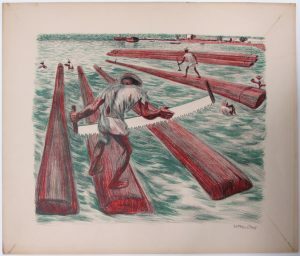 In 1946, the Taller de Grafica Popular (People’s Graphic Workshop) in Mexico City published a portfolio titled Mexican People that consisted of twelve lithographic prints by ten different artists depicting scenes of Mexican working life. 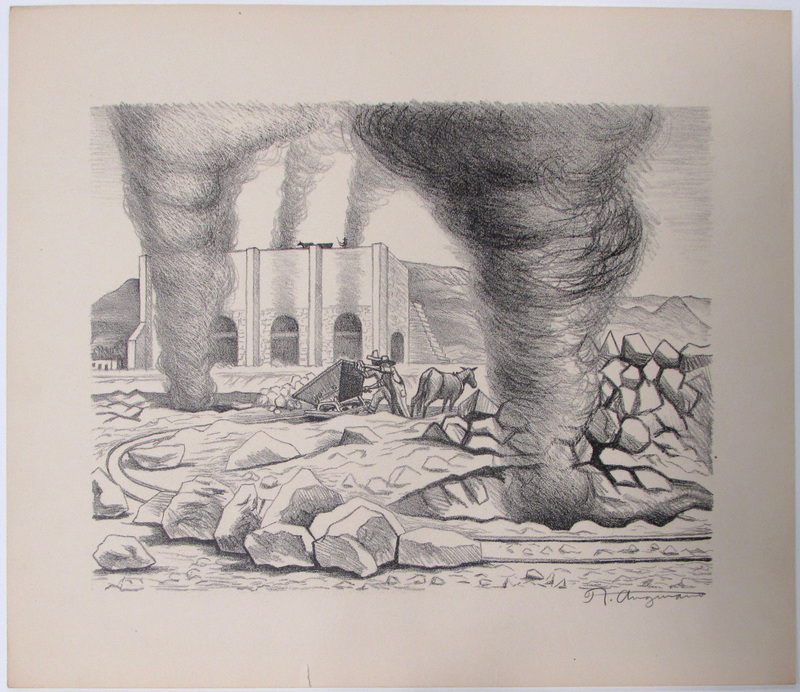 The purpose of the portfolio was to help Americans better understand the peoples and cultures of Mexico as both countries struggled to readjust to new global economic conditions after World War II. 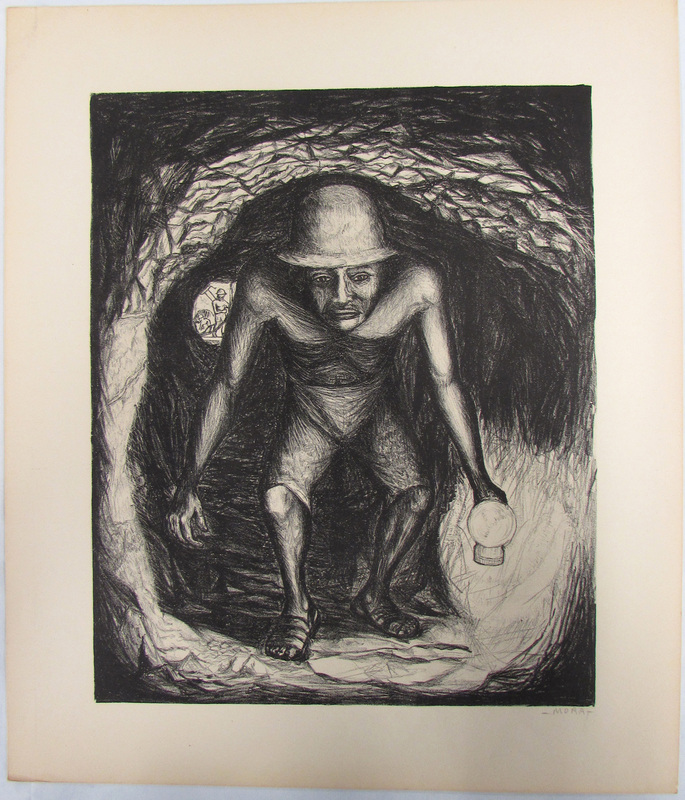 The Kruizenga Art Museum purchased an intact copy of the Mexican People portfolio in January, 2016. It has since become one of the most heavily used artworks in the museum’s teaching program as every year it is shown to multiple Spanish language, history, and interdisciplinary studies classes. 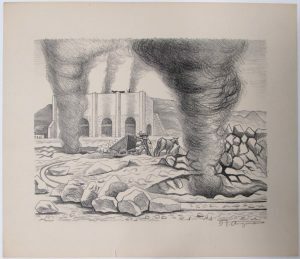 The Taller de Grafica Popular, or TGP, was a printmaking collective that was founded in 1937 to promote the goals of the Mexican Revolution and other left-wing causes. During its heyday from the late 1930s to the late 1950s, the TGP produced thousands of low-cost prints and posters aimed at supporting workers’ rights, combatting corruption and violence, and promoting national and international unity. Publication of the Mexican People portfolio coincided with the 100th anniversary of the start of the Mexican-American War, which lasted from 1846 to 1848 and resulted in the United States claiming a large portion of Mexico’s northern territory. It also coincided with a renewed conversation about immigration that occurred as American politicians debated what to do about the Bracero program, which brought hundreds of thousands of Mexican workers to the United States to fill vital farm and factory jobs during World War II. Although Bracero workers were supposed to come into the US on fixed-term labor contracts, some wanted the ability to extend their contracts while others wanted to stay in the US permanently. Many American farmers supported extending the Bracero program as they had become highly reliant on Mexican labor to maintain their agricultural output. In the end, the Bracero program was extended until 1964 and provided a legal channel for more than five million Mexicans to work in the US on a seasonal or full-time basis during those years. The Mexican People portfolio presents a positive image of Mexicans as being hardworking and industrious. It includes captions in both Spanish and English that explain the subjects of each print and shows on a map of Mexico where the different scenes are located. The portfolio was distributed in the United States through Associated American Artists, a New York-based gallery that was dedicated to providing original works of art at affordable prices to middle-class consumers. Approximately 250 copies of the portfolio were issued in the United States. Some of the portfolios were broken up and the prints were sold off individually; other copies of the portfolio were kept intact. The complete portfolio is on view in the Kruizenga Museum through January 26. Admission is always free and everyone is welcome. Gallery hours are Tuesday through Saturday, 10am to 4pm. Mexico is home to some of the richest silver deposits in the world. After the Spanish conquest of Mexico in the 16th century, huge quantities of Mexican silver were shipped overseas to fuel the economies of Europe and Asia. Historically most Mexican silver was mined by hand. Miners often worked in low tunnels with poor ventilation and drainage and accidental deaths were common. The exploitation of Mexican mines and miners continued well into the 20th century, as we see in this Francisco Mora print depicting a miner working in the state of Hidalgo north of Mexico City. Lime is a calcium-rich mineral that was traditionally produced by burning limestone or chalk in large kilns. It is a vital ingredient in cement and concrete around the world. In Mexico it is also often used to whitewash adobe houses and to prepare maize for cooking. Making lime can be dangerous. The smoke from the kilns contains particles that can damage the lungs, while the intense light of the kiln fire can damage the eyes. Raul Anguiano captures the hot, back-breaking nature of lime production in this image of a lime factory near the town of Tula de Allende in central Mexico. The Lacandon Jungle in the state of Chiapas in southern Mexico is a lush tropical rainforest filled with a bountiful variety of trees, plants and animals. Because it was remote and difficult to access, the Lacandon Jungle remained relatively intact until the late 19th century. Since then, however, large sections of the rainforest have been cut down to make way for mining operations, coffee and rubber plantations as well as agricultural farms and ranches. Today only ten percent of the original forest remains untouched. This print depicts sawyers in the Gulf Coast port of Ciudad del Carmen cutting tropical hardwood logs from Chiapas into standard lengths so that they can be shipped off to market in the United States and Europe.